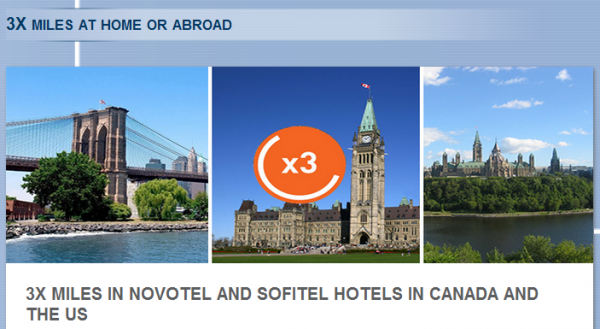 Le Club Accorhotels has a new Canada Aeroplan member offer of triple miles for a stay at Novotel or Sofitel hotel in the United States or Canada between May 1 and August 31, 2014. This offer is valid for the bookings made between the same dates as well. You must have chosen Aeroplan as your preferred earning preference and have the automatic deposit enable after each of your stays. There doesn’t seem to be a requirement to book any specific rate plan to be eligible for the triple miles. The terms and conditions refer to “a stay” that would indicate that you can take advantage of this offer once once. Note that the ending date for this promotion on the terms and conditions is August 31 but on the text itself June 30. If you are collecting Aeroplan miles, this could be a worthwhile offer for one stay during the two month offer window. 1. General Le Club Accorhotels terms and conditions apply to the 3X Aeroplan Miles offer. 2. This offer is valid for a stay from 5/1/14 to 8/31/14 in one of the participating hotels, and booked between 5/1/14 and 6/30/14. 3. This offer entitles Le Club Accorhotels Loyalty members, regardless of their status, to benefit from earning triple points in one of the participating hotels in the US and Canada. 7. The bonus will be credited in Le Club Accorhotels points within 10 days following the end of his/her stay and converted into Aeroplan miles according to applicable conversion rule. 8. In order to benefit from this bonus, the member must have activated Aeroplan as the preferred conversion option before the stay.